Hanza is the main protagonist of the story. He is a known as "bloody dragon" one of the strongest delinquents, unbeaten until he got into a fight with Fujuki, Honami due to a misunderstanding; he then suddenly felt his heart pounding for this cute but strong girl but as she stood in front of Hanza she said "I hate weak men" making Hanza's lost even deeper. 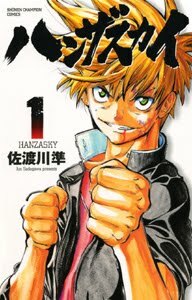 Soon he learns that she belongs to the karate club, he decides to join and prove to Fujuki that he is strong and hopefully notice his feeling for her.